Glasgow is Scotland&apos;s largest city, a bustling metropolis and not the most obvious destination for a walker. But the city itself is fascinating to explore on foot, with its rich heritage and unique architecture - the legacy of men such as Alexander Greek Thompson and, of course, Charles Rennie Mackintosh. Through the heart of the city flows the mighty River Clyde, once home to the legendary shipyards. Today the river provides a walking route heading east through the city and on into Lanarkshire. West of Glasgow is Inverclyde, leading out to the island-spattered waters of the Firth of Clyde. Inland are the spacious rolling hills of the Clyde Muirshiel Country Park, like the Campsies to the north providing a breathing space and escape for those from the city. 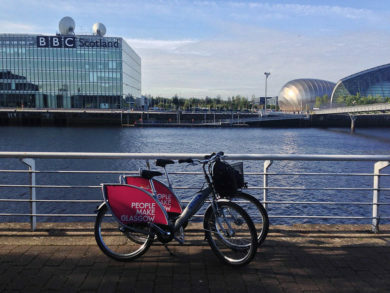 Fiona Russell takes a look at the outdoor opportunities around Glasgow. "Despite being Scotland’s biggest city, it is surprisingly easy to leave Glasgow behind for a remote-feeling countryside adventure. Head out of the city boundaries in almost every direction and you discover farmland, hills and mountains that seem to pop up almost instantly."